Typically, a family member serves as the primary caregiver and, when appropriate, helps make decisions for the patient. Members of our Palliative Care staff make regular visits to assess the patient and provide additional care or other services. Our Palliative Care staff is on-call 24 hours a day, 7 days a week, 365 days per year. 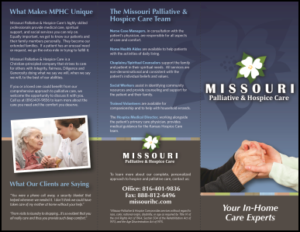 Missouri Palliative & Hospice Care is a Christian principled company that strives to care for others with integrity, fairness, diligence, and generosity; doing what we say we will when we say we will to the best of our abilities. If you or a loved one could benefit from our comprehensive approach to care, we welcome the opportunity to discuss it with you. 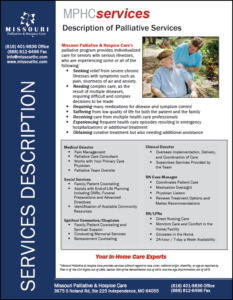 Call us at (816) 401-9836 to learn more about the care you need and the comfort you deserve!